60 & 90: Propositions you, your friend, your mom, your mom’s friend and everyone in the county should know about! These two Propositions, 60 and 90, were passed in 1986 and 1988 to diminish property tax burdens for “senior citizens” looking to buy new property. You see in California when you buy a home, the property is reappraised and a new base tax is determined. However, with Propositions 60 and 90 or “60/90” persons 55 years or older can transfer their existing home for another home in a participating county of same or equal value and keep their original tax base! The 60/90 transfer can only be made once. The only exception is if you have already used the base year value transfer and after the original claim you become severely disabled and must move because of your handicap. In this case Proposition 110 comes into play, and your base year value can be transferred again. If your spouse passes away or you get divorced, this does not qualify you or your spouse to use the transfer again. The following counties accept intercounty (between) transfers: Alameda, El Dorado, Los Angeles, Orange, Riverside, San Bernardino, San Diego, San Mateo, Santa Clara, Tuolumne, Ventura. If you still have questions, please refer to the Letter to Assessors No. 2006/010 or call the Assessment Services Unit at 916-274-3350. Thank you for reading! 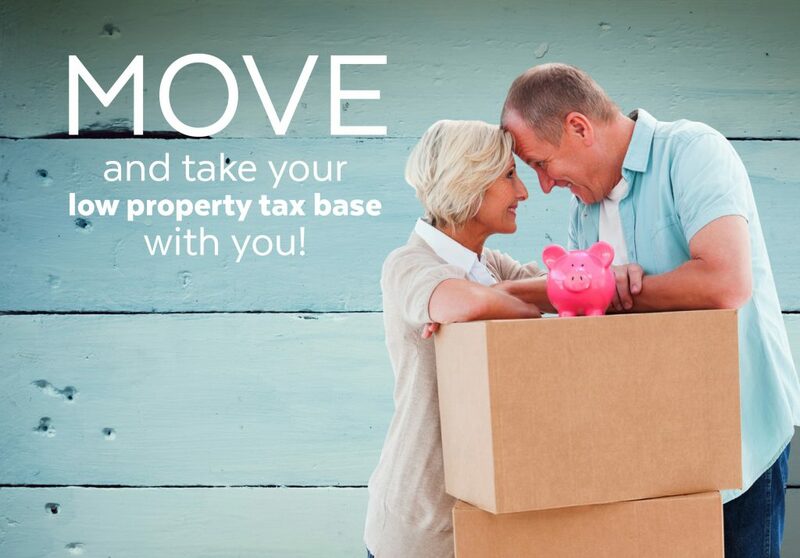 We hope you utilize this wonderful property tax transfer opportunity. If you would like to discuss further details or begin the search for an adequate replacement property, give us a ring! One last tip, before you sell your original property, add some improvements to increase the assessment value, giving you a higher price range for replacement properties. Contact a RE/MAX Estate Properties agent to help determine what improvements would give you the highest return in value.